by Martin Malden on 4 April, 2011. Last updated on 26 January, 2018. I wrote back here about moving my email to Gmail and how, by setting it up correctly, no one will ever know. You can make it absolutely transparent (so it appears to be coming from your own servers) and it’s easy to set up and link an effective signature. But I didn’t describe how to do it. Choose whether to send email via Google's servers or your own. 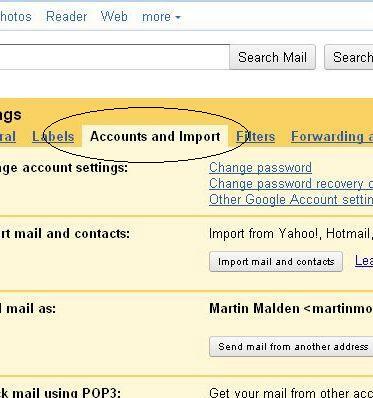 Although the default is set to Gmail, the better option is to send through your (or your email provider’s) servers. Some spam filters can treat email that appears to come from Yahoo (or your own email provider) but actually comes from Gmail as spam. Note that Gmail will assume the SMTP server details (the top line) but these may not be correct. For example, my outgoing mail server is mail.domain.com, not smtp.domain.com. If you’re currently using an email client (Outlook or Thunderbird) the correct details will be in the section on accounts. If you’re not able to retrieve them that way you may need to ask your email provider for the correct details. 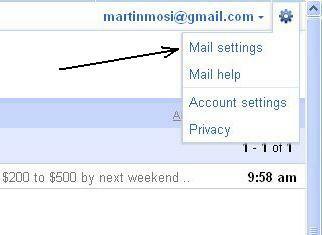 When you click ‘Add Account’ Gmail will send a verification email to the email address you’ve specified. Get the verification code from your other address and add it to the box. On verification your new email will appear below your gmail address. Lastly (for adding a ‘Send mail as’ address) you need to check the radio button against ‘Reply from the same address the message was sent to’. If you have more than 1 address (which you will: the one you’ve just set up and your Gmail address) this will ensure that the correct one is used in replies. 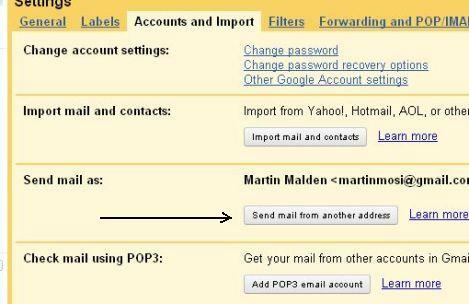 Add your POP3 (incoming) email address details. Enter your email address and click ‘Next Step’. Fill in the details, your password and choose your settings. Your new email account is displaid after the details have been correctly entered. That’s it – you’re all done. 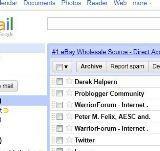 Gmail is your new email client and no one will ever know. I’ve only used the option reply address to show our standard business email address, but this seems to go a bit further and I might used your detailed explanation for future references. The reason I use the reply address option as a back up for when I need to work from home (all business emails are also forwarded to Gmail as back-up and for the same reason), hence I hardly use Gmail to reply to incoming emails. If that happens, all emails sent through Gmail have an added signature: (Email sent through alternative – off work – account). I’ve been using Gmail in this way for about 6 or so months now and I’m super pleased with it. One of the biggest benefits is when I travel – I can get my email in exactly the same way as when I’m at home and everything is in one place. I think Gmail is great except the fact that Google do not respect privacy as I would. Interesting,but I’m not touching it. Spent the last two nights guessing my way through adding a new, shorter gmail address, got it and even managed to have it on the list with other two so I could click into all three addresses (won’t get into why I already had two, plus yahoo). Fine. That done, since it was after 12, I clicked on Google Analytics. Horrors! Flatlined. Zero data. Tried to get things squared away on my Word Press dashboard, but won’t know for sure until enough time has passed for Google to find me again. Or not. So, thanks for the detailed information, Martin, but I think I’ll just file it with some of your other blogs I’ve kept. I may want to use it later. Thanks for posting this. It helped a bunch when setting up my account for another site. My only issue now is that it doesn’t automatically delete the mail from the server so every few months I have to go in and delete some email. 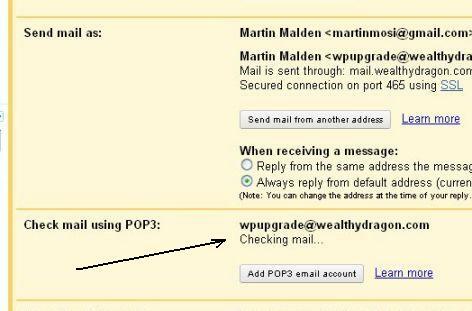 There’s a check box in the POP settings section that enables you to define whether or not mail is left on the server. The only mail that gets left on the server after you’ve checked that box is mail that contains suspicious attachments – which is very fine by me..! Thanks Martin. I missed that on the initial set up.